51 Foot Straight Mast Boom Rental – Genie S-45, is available for rent in Rochester NY, Ithaca NY and the entire Western New York region from the Duke Company. 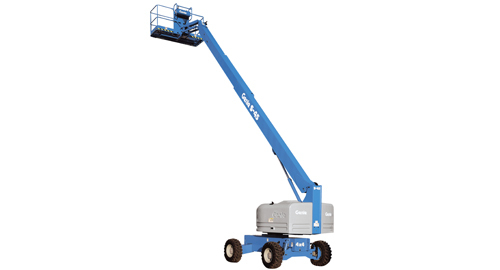 The Genie S-45 capability includes 360 degree continuous rotation capability and rotating, self-leveling platform with hydraulic platform rotation. Working Height = 51 feet. Platform Height = 45 feet. Horizontal Reach 36 feet 8 inches. Weight (standard) = 15,320 pounds.